Just a reminder that the SCV Center for Photography rents our studio space for your studio projects. We rent in 2 hour blocks. Our rates start at $120 for the first 2 hours and the per hour rate drops as you add additional hours. This rate also includes 1 of our backgrounds. If you don’t have lighting, we can handle that as well with our studio lighting packages. So if you are looking for space to photography that special project, give us a call. Our space is also available for rent for meetings, classes or corporate training events as well. We have tables and chairs available for meeting rentals as well. Today we are pleased to post a guest blog entry by instructor David Saffir on Two-Light Portrait Photography. Studio lighting can be quite simple, or complex. Beginner or seasoned pro, lighting can be a matter of personal style, equipment on hand, time constraints, or other factors. I recently photographed Sarah Muldorfer, a model from our area at the SCV Center for Photography. We had started out with a multi-light, high-key setup. Once that was completed, I wanted to switch to a simpler look that emphasized her elegant dress, long hair, and long limbs. Her position on the set is about 6-8 feet in front of the backdrop. Look at the lighting diagram. 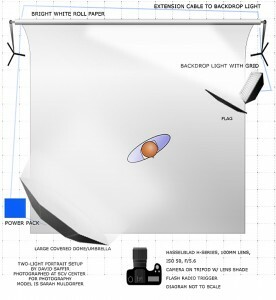 There is one primary light, a large umbrella/soft box located camera left, with its center approximately the same level, or a bit higher, than the lens axis. The umbrella is covered with a diffuser. The second light is also a strobe, set up with small reflector and a barn door. It was used to create a “spotlight” effect on the white background. The light is aimed nearly parallel to the background, and was set to low intensity relative to the main light to create the effect. Normally I place a flag – such as a piece of foamcore – between a light and the camera to keep the image clean. Also, shooting an image like this with limited lighting pretty much requires that you eliminate ambient lighting – any source can cause issues – including an open door or window, other studio lights, etc. I often mount the camera on a Gitzo tripod w/ ball head during a shoot. This is a rock-solid setup that works well during shoots where camera position changes fairly frequently. However, Sarah was experimenting with some different poses, and I took the shot hand held, almost as a candid. Exposure was f/8 @ 1/100, ISO 50, 100mm lens (medium format). If that shutter speed seems slow to you, remember that the strobes are firing at a speed of at least 1/1000! Exposure is very important in this type of shot. If overexposed, detail in the model’s fair skin would be lost. If underexposed, the shadow/highlight transitions, particularly on her skin, would at best be noisy and at worst show a mix of color aliasing and artifacts. I used a hand-held meter to measure exposure. (note: always point the meter into the lens of the camera, not the light. Meter position is usually just under the chin of the subject.) Underexposure would also reduce, or eliminate details in her black dress. Last, her pose turns most of her body toward the light. The umbrella-diffuser combination gives a wonderfully soft light, which still brings up the details. Her nose does not “break the line” of her cheek, and since she was moving when the shot was taken she looks relaxed and natural. I think this was the shot of the day, and she was very please with it. For more on Two Light Portrait Lighting, join us on Thursday, January 21st for our Classic Two Light Portrait workshop from 6:30pm to 9:30pm. Call for enrollment information as class size is limited.